The beautiful Attmore-Oliver Garden is available for your wedding, rehearsal dinner, family reunion, etc. A 40′ x 40′ tent fits comfortably on the grassy lawn behind the Attmore-Oliver House, restroom facilities are found in our historic brick smokehouse, and a kitchen is available for plating food. The Battlefield Pavilion is the perfect place for family reunions, church gatherings, scouting events, or even a rustic wedding. 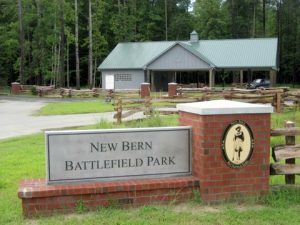 Located at the entrance to our Battlefield Park, just off Highway 70 East, east of New Bern, it is easily accessible. There is an area to plate food and restroom facilities are in the building. It is surrounded by beautifully wooded grounds that was part of the Battle of New Bern, March 14, 1862. To reserve the grounds and gardens of the Attmore-Oliver House or the Battlefield Pavilion for a specific date, please call our office to discuss availability. A contract must be signed and a deposit submitted in order to secure your rental. The security deposit will be returned following the event if there is no infraction of contract. One month prior to the event, the full rental fee is due. 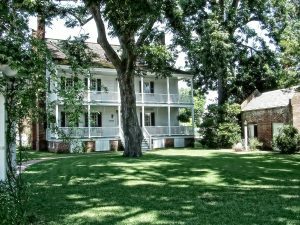 To review our list of rental conditions for the grounds and garden of the Attmore-Oliver House click here and for the Battlefield Pavilion click here. Please contact our office to visit our our grounds and garden our to request a rental contract.